The answer to "What generation am I?" is determined by what year you were born. Note that generations overlap a little so you may consider yourself another generation if you are born close to the generation before or after. While reading about the different generations, ask yourself these questions: Do our descriptions of your generation fit you? What generation describes you? Which generation do you wish you were? 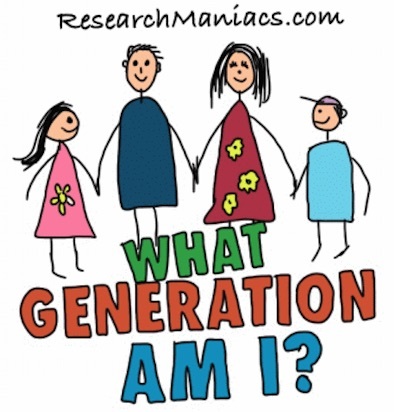 To read about your generation, please choose the year you were born below and press "My Generation"
This is Research Maniacs' interpretation of "What Generation Am I?" Other researchers and historians may use different years and interpretations. What defines your generation is how your parents raised you and what society is like during the time you grew up. War, technology advances, scandals, social issues, economy and so on, all defines your generation. What generation am I if I was born in 1900? What generation am I if I was born in 1901? What generation am I if I was born in 1902? What generation am I if I was born in 1903? What generation am I if I was born in 1904? What generation am I if I was born in 1905? What generation am I if I was born in 1906? What generation am I if I was born in 1907? What generation am I if I was born in 1908? What generation am I if I was born in 1909? What generation am I if I was born in 1910? What generation am I if I was born in 1911? What generation am I if I was born in 1912? What generation am I if I was born in 1913? What generation am I if I was born in 1914? What generation am I if I was born in 1915? What generation am I if I was born in 1916? What generation am I if I was born in 1917? What generation am I if I was born in 1918? What generation am I if I was born in 1919? What generation am I if I was born in 1920? What generation am I if I was born in 1921? What generation am I if I was born in 1922? What generation am I if I was born in 1923? What generation am I if I was born in 1924? What generation am I if I was born in 1925? What generation am I if I was born in 1926? What generation am I if I was born in 1927? What generation am I if I was born in 1928? What generation am I if I was born in 1929? What generation am I if I was born in 1930? What generation am I if I was born in 1931? What generation am I if I was born in 1932? What generation am I if I was born in 1933? What generation am I if I was born in 1934? What generation am I if I was born in 1935? What generation am I if I was born in 1936? What generation am I if I was born in 1937? What generation am I if I was born in 1938? What generation am I if I was born in 1939? What generation am I if I was born in 1940? What generation am I if I was born in 1941? What generation am I if I was born in 1942? What generation am I if I was born in 1943? What generation am I if I was born in 1944? What generation am I if I was born in 1945? What generation am I if I was born in 1946? What generation am I if I was born in 1947? What generation am I if I was born in 1948? What generation am I if I was born in 1949? What generation am I if I was born in 1950? What generation am I if I was born in 1951? What generation am I if I was born in 1952? What generation am I if I was born in 1953? What generation am I if I was born in 1954? What generation am I if I was born in 1955? What generation am I if I was born in 1956? What generation am I if I was born in 1957? What generation am I if I was born in 1958? What generation am I if I was born in 1959? What generation am I if I was born in 1960? What generation am I if I was born in 1961? What generation am I if I was born in 1962? What generation am I if I was born in 1963? What generation am I if I was born in 1964? What generation am I if I was born in 1965? What generation am I if I was born in 1966? What generation am I if I was born in 1967? What generation am I if I was born in 1968? What generation am I if I was born in 1969? What generation am I if I was born in 1970? What generation am I if I was born in 1971? What generation am I if I was born in 1972? What generation am I if I was born in 1973? What generation am I if I was born in 1974? What generation am I if I was born in 1975? What generation am I if I was born in 1976? What generation am I if I was born in 1977? What generation am I if I was born in 1978? What generation am I if I was born in 1979? What generation am I if I was born in 1980? What generation am I if I was born in 1981? What generation am I if I was born in 1982? What generation am I if I was born in 1983? What generation am I if I was born in 1984? What generation am I if I was born in 1985? What generation am I if I was born in 1986? What generation am I if I was born in 1987? What generation am I if I was born in 1988? What generation am I if I was born in 1989? What generation am I if I was born in 1990? What generation am I if I was born in 1991? What generation am I if I was born in 1992? What generation am I if I was born in 1993? What generation am I if I was born in 1994? What generation am I if I was born in 1995? What generation am I if I was born in 1996? What generation am I if I was born in 1997? What generation am I if I was born in 1998? What generation am I if I was born in 1999? What generation am I if I was born in 2000? What generation am I if I was born in 2001? What generation am I if I was born in 2002? What generation am I if I was born in 2003? What generation am I if I was born in 2004? What generation am I if I was born in 2005? What generation am I if I was born in 2006? What generation am I if I was born in 2007? What generation am I if I was born in 2008? What generation am I if I was born in 2009? What generation am I if I was born in 2010? What generation am I if I was born in 2011? What generation am I if I was born in 2012? What generation am I if I was born in 2013? What generation am I if I was born in 2014? What generation am I if I was born in 2015? What generation am I if I was born in 2016? What generation am I if I was born in 2017? What generation am I if I was born in 2018? What generation am I if I was born in 2019? What generation am I if I was born in 2020?